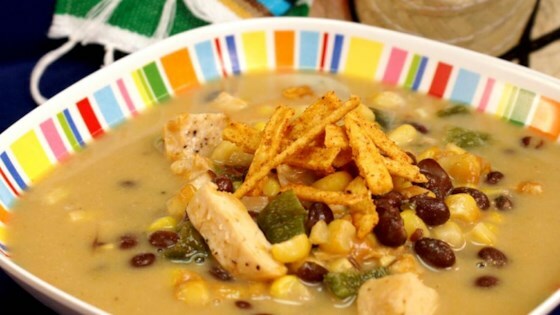 "This semi-spicy, comforting soup goes great with corn bread." Cut the peppers in half from top to bottom; remove the stem, seeds, and ribs, then place the peppers cut-side-down onto the prepared baking sheet. Cook under the preheated broiler until the skin of the peppers has blackened and blistered, about 5 minutes. Place the blackened peppers into a bowl, and tightly seal with plastic wrap. Allow the peppers to steam as they cool, about 20 minutes. Once cool, remove the skins and discard. Dice the roasted peppers. While the peppers are cooling, melt the butter in a pot over medium heat. Whisk in the flour, and stir until the mixture becomes paste-like and light golden brown, about 5 minutes. Gradually whisk the chicken broth into the flour mixture, and bring to a simmer over medium heat. Cook and stir until the mixture is thick and smooth, about 10 minutes. Stir in the diced peppers, diced chicken, corn, black beans, Cheddar cheese, and pepper jack cheese. Season with cumin, garlic powder, salt, and pepper. Bring to a simmer, and simmer until the cheese has melted and the soup is hot, about 10 minutes. Serve sprinkled with tortilla chips.